Ubuntu One file syncing should be fixed so that it works OK when a proxy has been configured in System->Preferences->Network Proxy. I went ahead and modified the description of this bug to make it match something that I think can be done as a first step. I'd like to get regular proxy support working before trying to tackle authenticated proxies and virus scanners. I've discussed this bug with a couple of developers and we are looking into fixing it, so I'm also going to increase the priority from wishlist. I am trying to connect through a HTTP proxy without auth and it is not working. My proxy settings are configured at system-wide level by GNOME. Can you describe where you are having the problem? After I connect, the applet stays in the mode "working" forever. I am trying to connect through a HTTP proxy with auth, and nothing happens. I configure proxy in global GNOME menu and Synaptic menu. My update is working... but ubuntuone not. Has anyone reporting this error gone through the process of "Authorizing your Computer" to access Ubuntu One the first time the application started on your computer? 4. You should have and UbuntuOne password in the list. No, there are only my wireless and proxy key. After clicking on the ubuntu one applet, in application menu, nothing happened, i can't see "Add this Computer" button in the FireFox. On my desktop, this step working, but there is not HTTP Proxy. Mathias: are you after using a separate (different) proxy server just for U1 uploads/downloads, or does u1sync-daemon just need to use the system-wide configured proxy server (eg. in GNOME). I can't figure out from the discussion in this bug whether UbuntuOne in fact does use the system-wide (gnome) proxy settings or ignores them and does not support connecting through a proxy at all. Could someone clarify whether this functionality exists and if not, whether it is a planned feature? As far as I understand, for the moment proxy support is not working. I used global proxy settings, with the correct user credentials set for the authenticated proxy. It's amazing to see such a confusion about proxy supported or not in a ubuntu product ! Why put a system wide proxy option inside the System/Preferences if after that you don't use it in your own tools ! And it should be stated clearly that if you have a proxy settings in a machine YOU SHOULD USE IT . Currently, it looks like there's no proxy support at all. I've a proxy without authentification and it doesn't work. Hi there, same thing here Ubuntu One does only connect without any defined proxy. As soon there is a http/https-proxy defined, it doesn't connect anymore, even not with a locally installed privoxy. Verified with 9.10 (Karmic) 32-bit & 64-bit. Unfortunately its a problem for me too. From my University where I have to use a proxy to go online, i cant use ubuntu one. Is that feature on its way? Any news regarding this issue? I think, it should not be categorized as "Whishlist" because it was announced as one of the blazing new features of karmic. So it should be fixed very soon, because this is a very bad user exparience especially for corporate users. I also think this shoul be fixed. I dont know if this is symptom of something else since mor programs have promblems with proxy (such as epiphany messenger). This creates problems also for people who tries to use ubuntu in a university environment. Univeristies anywhere normally only allow internet connections through a proxy server. One does not work for me even behind non-authorizing proxy. Hangs in "connecting" state. wget works from console, firefox as well, chat programs as well. I definitely think that the One client does not support proxy at all. Note: it works for me outside of corporate environment not using any proxy. Can not use ubuntu one in a corporate network behind a proxy. I can not even connect this machine with my ubuntu one account. "[errno socket error] [errno 111] connection refused"
Yes, this feature is so important, please add it. I agree, the lack of proxy support is the one thing stopping me from getting a 50GB Account. Yes, please add such a feature that is mandatory for corporate and educational working environments. Same here, just started to use 9.10 a bit more frequent for work in the office. > file until it has been scanned and verified clean). I have to agree, this should not be under "Wishlist". As Y. Juet already stated there are many environments where this feature is an absolute necessity. Lacking proxy support makes this client useless for me on 50% of the locations i am normally (work vs. home etc.). Unless this is not changed I won't change (can't) from Dropbox. I am also interested in paying 10 bucks for 50GB on UbuntuOne. But only with proxy support and probably a basic Windows client. But I guess this should be just a matter of time. thank you very much for your attention paying to this. > - download of a file until it has been scanned and verified clean). > + in System->Preferences->Network Proxy. > + increase the priority from wishlist. > - in System->Preferences->Network Proxy. > + has been configured in System->Preferences->Network Proxy. > increase the priority from wishlist. > has been configured in System->Preferences->Network Proxy. For proxy detection we have python-libproxy which is a great library. That should not be difficult, in ubutunone tests they already have commented proxy tests. > For proxy detection we have python-libproxy which is a great library. I have had problems with proxy in 9.04. 10.04 is coming but these problems are still here. I'm trying to bring up 10.04 behind a corporate proxy and it appears that Ubuntu One is connecting to the proxy - but thinks it's the Ubuntu One web server instead of a proxy! Would consider upgrading to 50gb account if I knew this could work with college http proxy. Hope progress made soon. Everyone affected by this bug should also sign up for Bug #516032 (add-apt-repository not working behind a proxy) and Bug #304889 (empathy not working behind proxy), as they are sure to be affected as well. Ubuntu One is dead! One year left! Simple bug kill it. This is really annoying. Is there any workaround for that issue? I am closing this newly opened "Ubuntu" task as it is not required and the "Ubuntu One Client" task is already assigned to the relevant team. Just to give some context: This is one of those bugs which is currently stopping me upgrading my U1 account. Everything syncs at home, but until the account is usable in my work environment, U1 is essentially just a toy to me. Genuine productivity would come from auto file syncing at work and at home (both machines are Ubuntu), and I would gladly pay for premium services if this was working. > are needing to work behind. @cuby this bug is being worked on currently, and we are aware it affects many users. The feedback we need right now is what kind of proxy setups are most common in our userbase so we can focus on fixing those cases first. The current resolution status for this bug is: we are working on it, but it's still going to take months to get a useful implementation released. I am marking as in progress. 1) Home usage , through a Smoothwall firewall , which uses Squid in transparent proxy mode. 2) Work use , unknown proxy type, but probably a squid derivative or M$. This uses either a manually defined FQDN or IP address or you can use a proxy.pac file which contains multiple proxy definitions depending on which country you happen to connect to the corporate network on. typically on TCP port 8080 or 8000. I could supply the pac file - IP's changed of course - if that would be useful? 3) Using ssh/corkscrew tunneling through above proxies using a Socks 5 proxy on any TCP port above 1024. This is used for anonymous communications. This leverages the -D parameter of the ssh applications on Linux. Hope this helps, if you need any further information then please just shout. I (using ubuntu-one with KDE on Kubuntu) switch the proxy on-off via script (in /etc/X11/Xsession.d ) depends on some characteristically parameter at work or at home. I set then the environment variables, the kde proxy, the davfs proxy, etc. ON or OFF. So, a good solution for me is the possibility to change a configuration file. The best solution is, if ubuntuone receive the proxy from the environment variables automatic. outbound connections only on port 80 and 443.
:-) And on even smaller percentage of Ubuntu Linux users. > it's still going to take months to get a useful implementation released. > I am marking as in progress. Non-authenticated proxy on port 3128 with *.pac file available. It lets 80 and 443 out, not much more it seems. At work I have an authenticated (login and password) http, https, ftp and socks proxy on port 8080. We are about 1000 people and about 10% use linux. I'm using a HTTP proxy on port 80 with no authentication - it uses MAC filtering to determine which users to grant or deny access to. HTTP and HTTPS connections are allowed out, but FTP is blocked. Our university dormitory network is connected to Internet via HTTP(S) proxy probably powered by McAfee Web Gateway 6.8.7 Build 9396. No authentication required (the wired connection to the network is already authenticated by 802.1X PEAP). We're using squid/2.7.STABLE5 proxy on port 8081. Manual configuration is needed, no transparent proxy. some ports, such as the one used for facebook-chat, appear to be open without proxy, but not many. I have the same issue, proxy using 8080 port, proxy configured manually or through automatic configuration ".pac" script file. I'm affected by this bug. I need proxy support with basic authentication (user/password) to have internet access from work. I am affected by this bug. Need proxy support with basic authentication on Windows client. Thanks. Hello, same issue for me, proxy using authentication, port 3128 (http, https, ftp and socks proxy). lophie, the bug is being worked on. However it's not trivial to fix. If you think it is, we are happy to accept patches though. Please don't spam our bug reports with such negative comments. Thanks everyone else who provided information about your proxy configurations. We have a good set of information about what methods to support to start, and whwere to go from there, and are working on it. Please be patient as we get the fixes implemented in our many projects, and work to get the support shipped out to you. It may not work for all of you to start, but we will continue to work on adding support for some of the more complex configurations, after getting the majority supported at first. Thanks again, and we're sorry you haven't been able to use Ubuntu One behind your proxies. 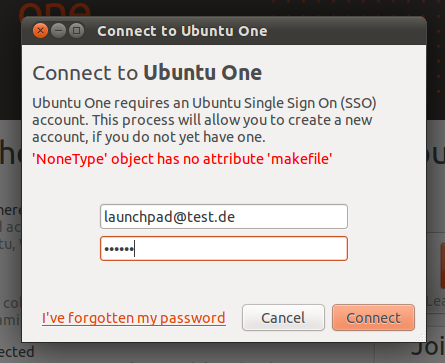 Rodney, I would say that part of "Ubuntu One" service is on sale, while its development it's clearly not completed yet. I would never pay the extra storage space for something that it's missing such a basic functionality, whereas the competitor (dropbox) started working perfectly from the very beginning. You say "it's not trivial to fix". I say: "do not put on sale something that you're not able to manage and fix. Leave it for free and than leave the bugs open until 2020". If you type "proxy issue" in launchpad, you can see a lot of bugs yet to be fixed. Maybe libproxy could be a common platform? I don't know that project just made a Google search and I noticed that it is under active development. When trying to connect to u1, the application totally freezes. I get an "Unable to find the server at login.ubuntu.com" error message when I try to connect to Ubuntu One from behind a proxy server. Great to see progress on this! However, is "Fix Released" the correct status for this bug if file sync does not yet work through a proxy? After signing in used space, "Devices", and "Account information" are displayed correctly. However, File Sync is still not able to connect. I dont think this should be marked as fixed. You need to install ubuntuone-client-proxy to be able to use file sync through a proxy. If it is not working for you after installing that, and restarting file sync, please file a new bug. The support generally works, but given the number of possible proxy configuration variations in the wild, some people may of course encounter issues, and we will work to resolve them as they are reported. I can confrim it works after installing ubuntuone-client-proxy! Since this bug is a duplicate for the proxy issues under windows will this fix propagate to the windows client at some point? Yes. There were some other issues that cropped up on Windows we are trying to fix right now, and had to roll back the 3.0.0 release because of them. I am behind authenticated proxy on Ubuntu 12.04 with latest updates. The fily sync gives me AUTH_FAILED error. As suggested, I have filed a new bug report (https://bugs.launchpad.net/ubuntuone-client/+bug/987638). Hope to get it resolved soon. @Vasilis If you're going to claim a bug still exists, at least explain the issue you are seeing. The file sync client supports proxies now. You do have to install the ubuntuone-client-proxy package to get it working, however. Behind proxy at work, sync client can't connect. Where can I find a log and post it ? @Edrin Please file a new bug report. The logs are in ~/.cache/ubuntuone/log/ . If you attach logs to your new bug, you may want to mark the bug as private first, as the logs will have file names and such data, if you don't wish that information to be public. After a fresh ubuntu 12.04 install, and after installing ubuntuone-client-proxy, launched ubuntuone and then install, login, setup and sync worked flawlessly. At last, after almost 3 years. good job! I am behind a proxy without authentication. Now will try on android and windows. However, It is a pity that tomboy support was removed. I am also behind a proxy and could not use Ubuntu One. With the ubuntuone-client-proxy package applied, I can now use the cloud as desired! Displaying first 40 and last 40 comments. View all 207 comments or add a comment. Ubuntu One Client: Does U1 support connection through a proxy server?